Apple will officially unveil the iPad 2 on March 2 at the Yerba Buena Center for the Arts Theater in San Francisco, putting an end to one set of rumors and sparking a whole new set. The (sort of) mysterious tech giant sent out not-so-mysterious press invitations that feature an iCal March 2 date and the words "Come see what 2011 will be the year of." The iCal date is peeled back on the top right corner to reveal an iPad. I'm going to go out on a limb here and say that Apple thinks the second generation of its iPad -- the iPad 2 -- is what 2011 will "be the year of." 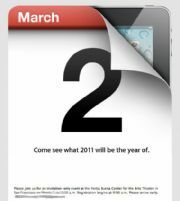 That pretty much puts an end to the rumors and speculations about when the iPad 2 will be announced; now it's time to speculate on what, exactly, we're going to see on March 2. People have been speculating about an iPad with a camera since the device debuted last year. In December, Chinese-made iPad 2 cases started showing up on the Internet -- some with rear-facing camera holes. The cases had a cut out on the bottom left, suggesting that perhaps the iPad 2 will have a rear-mounted speaker as well. In late January, Mac Rumors discovered an iPad screenshot with three new standard app icons hidden in the developer release of iOS 4.3 Beta 2. The new icons were FaceTime, Camera, and PhotoBooth, suggesting that some sort of camera will be making an appearance on the iPad 2. My take: The iPad 2 will have front- and rear-facing cameras, even though a rear-facing camera wouldn't make much sense. In January, we heard rumors of an improved dual-core graphics chip landing in the iPad 2 -- reportedly, to power a high-resolution (1,536 by 800 pixels) display. The rumors (reported by AppleInsider ) suggested that these specs would put 1080p HD video playback on the table. Less than a week later, more iPad 2 screen rumors popped up. First, that the iPad 2 would have a screen resolution of 2,048 by 1,536 pixels (thanks, Digitimes ), and then that it wouldn't. IDC research manager Tom Mainelli suggested that Digitimes' report got the resolution right, but the iPad version wrong -- the iPad 2 won't have a 2,048-by-1,536 pixel screen, but the iPad 3 might. Later in February, we also saw some leaked photos from a Chinese repair shop that showed no retina display. My take: I'm pretty sure the iPad 2 is going to have an improved screen and "better graphics," but 1080p video will only work in theory.